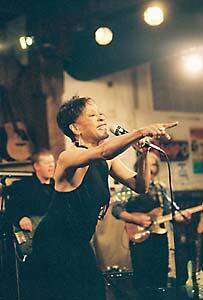 Soul belter Bettye LaVette made a more-than-respectable “comeback” album a couple of years ago. Her new effort, Scene of the Crime, shows that I’ve Got My Own Hell to Raise was no fluke. This woman, with her slightly raspy voice and impeccable taste in material, is on fire. LaVette’s late-blooming career is a weird story even by show-biz standards. She’s toiled away on the fringes of success for more than 40 years, and she’s just starting to reach her prime. She’s a true example of someone who has only gotten better with age. LaVette started out in the 1960s, the golden age of soul, though she never quite became a household name. In 2000, the European label Munich released a live LaVette album called Let Me Down Easy: In Concert. Her performance of its title song still twists my head off. The record wasn’t a runaway hit, but apparently some people who counted heard it. LaVette started recording in this country again. Two years ago, LaVette got the full Joe Henry treatment — covering songs by contemporary songwriters like Dolly Parton, Sinead O’Connor, Fiona Apple, and Lucinda Williams with a rocking band. I’ve Got My Own Hell to Raise is a good album, a really good album. But — I’ll go ahead and say it — Scene of the Crime is a great one. LaVette is no stranger to Muscle Shoals. She recorded an album there called Child of the Seventies about 35 years ago — which, in keeping with LaVette’s hard-luck biography, was not released until a few years ago. It’s true, DBT provides a harder-edged sound than the musicians on I’ve Got My Own Hell to Raise. But the band never overwhelms LaVette; it seems to inspire her. The album grabs a listener immediately with a slinky swamp rocker called “I Still Want to Be Your Baby (Take Me Like I Am),” written by Alabama native Eddie Hinton. There are several cool rockers here that seem natural for LaVette. John Hiatt’s “The Last Time” sounds like it was written for her. “You Don’t Know Me at All” is nice and bluesy. And LaVette also shows she can nail the slow ones. “Choices” is a song George Jones did just a few years ago, after a well-publicized alcoholic relapse. I don’t know how much of this tune applies to LaVette’s own life, but when she sings, “I found I liked drinkin’” a listener finds her completely believable. Among the most satisfying cuts is “Before the Money Came (The Battle Of Bettye LaVette).” Not only is it a rocking little number, but LaVette looks back on her career: “Some folks didn’t know my worth/Didn’t know where I fit in/40 years I kept on singin’ before the money started rollin’ in.” It’s a fitting triumph. * 100 Days, 100 Nights by Sharon Jones & the Dap-Kings. 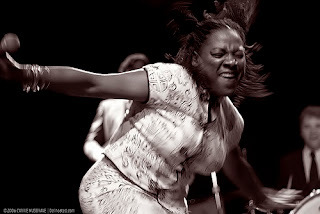 Ms. Jones is the undisputed queen of the current soul revival. She’s been making music since girlhood — singing in church and getting gigs as a background singer for R & B and even disco artists. But she had to keep a day job for too many years. She worked as a corrections officer on Rikers Island in New York — if that ain’l credentials, I don’t know what is. Jones made several singles for the Desco label in the late ’90s but didn’t make her own album until 2002, when she was in her 40s. Some accuse the singer of being retro. True, this music fits right in with good old Stax/Volt records. The Dap-Kings are nice and horny, with funky, Steve Cropper-ish guitar by Binky Griptite. True, it’s not hard to imagine Otis Redding singing “When the Other Foot Drops,” and “Let Them Knock” could have been a hit for Carla Thomas. But I don’t find the songs old-fashioned in the least. It’s just strong, honest music — about love, lust, and tears — that I like for the same reason I like those older records. Jones saved the best for first on this album — the title song is a minor-key steamer. But there’s not a weak tune here. There’s a little Motown gloss on “Tell Me” and a little bit of the swamp in “Nobody’s Baby.” And I bet the trumpet solo at the end of “Keep on Looking” goes on a lot longer when the Dap-Kings perform it live. * Wattstax: Music from the Wattstax Festival and Film. Speaking of old Stax music, this recently released three-disc collection is a treasure-trove. Most of the material has been released before, but this is definitive. Wattstax, for the uninitiated, was a 1972 music festival in Los Angeles, organized by the Memphis-based label and emceed by the Rev. Jesse Jackson. But even more fun is the abundance of worthy, if not as famous, Stax acts such as The Emotions, the Soul Children, Rance Allen, Lee Sain (who does a tune called “Them Hot Pants”), and Hayes’ songwriting partner David Porter. Perhaps my favorite cut is the nine-minute “Son of Shaft” by the wonderful, funky Bar-Kays. MORE SUNDAY POLITICS: COMPLETE WEIRDNESS DEPT. TOM UDALL: WILL HE GO FOR IT?